This summery soup is revved up with a dash of zingy homemade salsa. Each serving provides 311kcal, 11g protein, 6g carbohydrate (of which 6g sugars), 23g fat (of which 8g saturates), 4g fibre and 2.2g salt. For the soup, melt the butter in a heavy-based, lidded saucepan over a low to medium heat. Add all of the vegetables and fry gently for 4-5 minutes, or until just softened. For the salsa verde, put all the herbs in a food processor and pulse until roughly chopped. Add the shallot, anchovies, capers, lemon juice, mustard and oil and blend to a rough purée. Season, to taste, with salt and freshly ground black pepper. 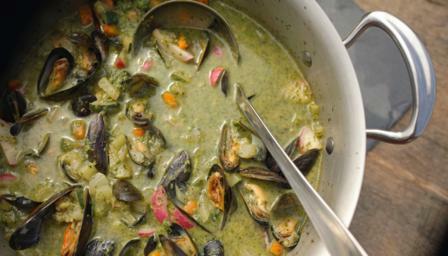 Remove the soup from the heat and stir in 2-3 tablespoons of the salsa verde.